Hello everybody, I was wondering if it's OK that my left hand first finger (actually just below the index finger) is touching the neck. I have no problems playing like that so far. BUT I am starting with vibrato and of course I can't do vibrato with my left hand touching the neck. There needs to be a space between the neck and the first finger. Now I was wondering if there should actually be a space between the first finger and the neck all the time. I've tried it today and it feels a bit weird. It does feel like more freedom but it messes with my intonation... I could get used to it of course, but don't want to develop bad habits... So, what is the right way for the distance between the first finger and the neck?? Thanks so much!! When I play the neck of the violin rest on the joint where the first finger goes into the hand. I do have an opening under the neck between the thumb and hand. This not me but similar to how I hold the neck. 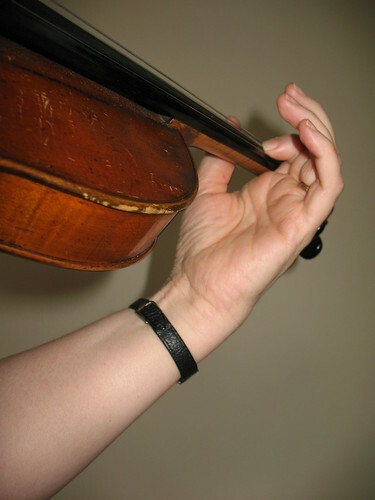 The difference - My thumb rest along side, parallel to the neck. And when you do vibrato, do you keep your hand like that or does the joint of your first finger come loose from the neck? I just found a related post https://fiddlerman.com/forum/learning-to-play/learning-vibrato-index-finger-base-knuckle/#p71611. It explains most of my question. All I would like to know now is if the index finger base knuckle should be off the neck at all times or only when you play vibrato. Who can help? The way my teacher showed me to practice, the base of your knuckle would move off the neck. I am the odd ball here. I do not do vibrato - I do bluegrass!! hehe!! Seriously though I have been so interested in getting the fullest, richest, emotion filled sound out of each note that I have not thought about gaining it. Ok, If you place the neck on your 'thumb print' you will open up your fingers, wrist and hand along with your arm to all kinds of freedom to do vibrato, and it allows you the most freedom to finger in all positions if you can slide on your thumb as necessary to get up higher on the strings. Try it, see if you can deal with the 'looseness' of that kind of grip. Yes it is normal for the base knuckle to touch lightly when not vibrating its a guide for our hands I have seen a few people play with index finger rarely touching but not many. Hope this helps. The way I understand it, in the beginning, you should always support the neck with the base of your index finger (exact position varies from person to person depending on shape and size of hands and fingers etc). As you progress and start learning vibrato, you gradually learn to support the neck without using the index finger, and are able to alternate between the 2 modes of support as required by what you're playing. That's the stage I'm at now, so I'm not really sure what happens next! Maybe eventually you can do without the index finger altogether while playing long passages with vibrato and just use it when you start and stop playing - probably you need to use it when shifting as well. But that's just speculation on my part.